However, it’s also an opportunity to inspire and educate other women. So, we asked eight very successful women in various occupations and industries to share their tips and advice with fellow women. "I meet a lot of talented women at career networking events and conferences who share with me their success stories in proactively seeking and developing great relationships with professional mentors," says Charlotte Westerhaus-Renfrow, J.D., clinical assistant professor of business law and management at Indiana University’s Kelley School of Business. She always encourages them to continue to seek the best mentors both inside and outside of the organization, and then asks the women about their sponsors. "Unfortunately, more often than not, the answer to that question is another question, ‘What is a sponsor?’ or worse yet, there is an awkward silence coupled with a blank stare." Westerhaus-Renfrow believes that women need mentors, but says they need sponsors even more. "A sponsor is, essentially, a mentor or advocate who works at your organization." So, what’s the difference? "While mentors can give advice in areas where a person is struggling, sponsors can help ease and even alleviate the actual barriers to advancing in your career," she explains. "Sponsors advocate and use their influence within the organization to advance the careers of talented individuals by directly getting them high-profile assignments and strategically connecting them to influential people." And, Westerhaus-Renfrow says ambitious women need mentors and sponsors. Heather J. Furnas, M.D., is a board-certified plastic surgeon and adjunct assistant professor in the Division of Plastic & Reconstructive Surgery at Stanford University. "Plastic surgery is a male-dominated field, and one of the biggest challenges for women surgeons wanting a family is timing when to get pregnant," Furnas explains. "The training infrastructure does not accommodate maternity leave and breast-feeding well, so many women surgeons delay childbearing until they have finished residency." Furnas says it’s no wonder women surgeons have higher rates of infertility and significantly fewer children than their male colleagues. However, this problem isn’t limited to women surgeons. A 2016 report by Bright Horizons Family found that 70 percent of women may postpone the decision to get pregnant out of fear that it could negatively impact their career. "If you want a family, start having kids when you want to, not when it is convenient for training programs, et cetera," Furnas says. "The infrastructure will change when more women do so." Motherhood and other life changes also factor into the advice from Diane Domeyer Kock, executive director of The Creative Group, a creative and marketing staffing agency. "Having made many changes throughout my career, either motivated by my personal life or emerging professional opportunities, I’ve learned that it is very important to be adaptable," she says. "Whatever your goals and priorities are now, they will likely change in the next few years — and then change again a few years after that." "It may be a promotion, joining a new company or being laid off, or personal changes, like having a child, relocating or taking care of a loved one," Kock says. "When new opportunities or changes arise, learn to recognize what’s important to you at the time and make decisions based on these shifting priorities." Vernice "FlyGirl" Armour was the United States Marine Corps’ first African-American female pilot, and she was recognized by the Department of Defense as the country's first African-American female combat pilot. After completing two tours in Iraq, Armour left the military and launched VAI Consulting and Training, which grew to a million-dollar business within five years. She is the author of "Zero to Breakthrough," and is a keynote speaker for Fortune 500 companies and leadership conferences. Armour says people always ask her how she overcame challenges and obstacles to become successful. "My answer is simple. Acknowledge the obstacles, don’t give them power; take action and make a gutsy move." How does she define a gutsy move? "In your gut, you know it’s right, and it takes guts to do it." Armour provides an example. "When I was flying attack helicopters over the deserts of Iraq supporting the men and women on the ground, I had to get permission from the ground controllers before we could engage the target." However, back home in the U.S., she says there are no ground controllers in life. "You are your ground controller, and if you don’t give yourself permission, who will?" 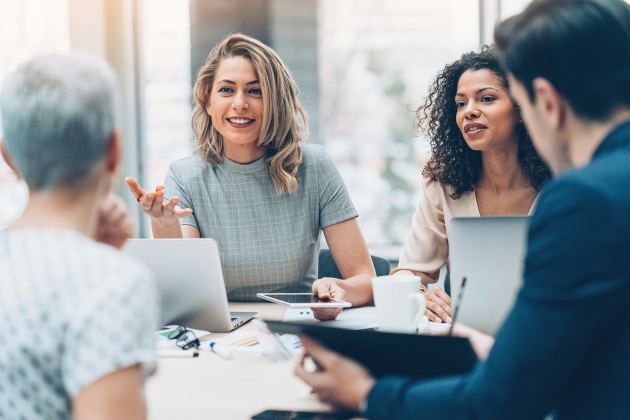 "My advice starts with a simple truth — we are all navigating our lives one conversation at a time, at work and at home," according to Stacey Engle, president of Fierce Conversations, a Seattle-based global training and development company. "It is critical that we find our voice and in turn engage in the conversations we are most afraid to have — and this may start with conversations with ourselves," Engle says. "Only when we are truly open and honest about what matters most do our biggest challenges and issues get resolved." Rachel Cruze is a personal finance expert, podcast host, and New York Times best-selling author of "Smart Money Smart Kids," which she wrote with her father, Dave Ramsey. "I think God gives each of us a unique set of circumstances and gifts that we can use in our careers," Cruze says. "Everyone has something special to offer — including you — so don’t waste time comparing yourself and your progress to someone else’s version of success." She explains that you bring something to the table that other people don’t — and vice versa. "We all have our strengths and talents," Cruze says. "Once you find them, lean into them and success will follow." "Fear will always be present when you’re trying something new," says Christy Wright, business coach and author of "Business Boutique: A Woman’s Guide for Making Money Doing What She Loves." "It’s not a sign to sink back and tuck your ideas away," Wright says. "It’s a sign that you’re stepping outside of your comfort zone, and that’s where growth happens." She says it’s natural to be scared at first because you’re trying something new. "However, the worst thing that could happen is that your idea doesn’t turn out like you hoped, but that’s not a big deal because you’ll have another one." Wright cautions against waiting for the fear to subside before taking action. "Just do it scared." Samaira Mehta is an 11-year-old entrepreneur who invented CoderBunnyz, a computer coding board game, when she was only 8 years old. In her young life, Mehta has conducted more than 70 free workshops teaching over 2,200 kids how to code, including teaching over 50 kids at Google’s headquarters and 60 at Intel’s headquarters. She also created an initiative, Girls U Code, and spoke at such events as CMG Impact 2016 Women in Tech, Google Launchpad, and Maker Faire. "Don't be limited by what you see other people do — follow your imagination and not other people's limitations," Mehta says. She also believes that you need to invest in yourself. "Don't say you don’t have time to do something or you’re too busy to find time for something," Mehta advises. "Time expands to accommodate your passions and priorities." She also agrees with the advice provided by some of our other women. "Find a mentor, because a mentor is like a light that guides through a dark tunnel," Mehta says. "And don’t worry about getting it wrong because mistakes are proof that you are trying."